This special offer is running for a limited time only and is available on a sale or return basis. 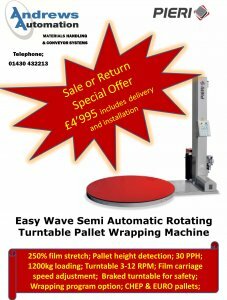 The Easy Wave Semi Automatic Rotating Turntable Pallet Wrapping Machine is available for £4,995 which includes delivery and installation. The semi-automatic turn table machine is designed as flexible and practical solution for customers who need a compact and simple machine with a good capacity, an excellent load stability and the wrapping quality of Pieri. 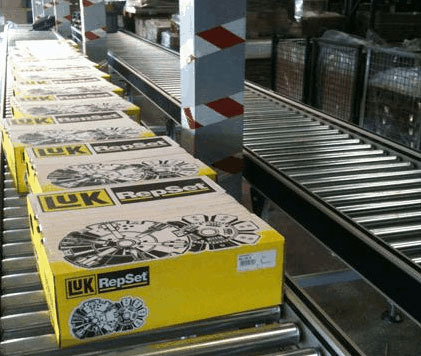 The operator can easily be able to manage the wrapping parameters thanks to the user-friendly control panel making it an ideal addition to an existing system or replacement of existing wrappers which have become inefficient. All installations are completed by our highly trained engineers who are available to provide onsite advice on and a demonstration of the Easy Wave pallet wrapping machine. For more information on this special offer or to arrange a purchase please contact the Andrews Automation sales team on 01405 768 900 to arrange delivery and installation.